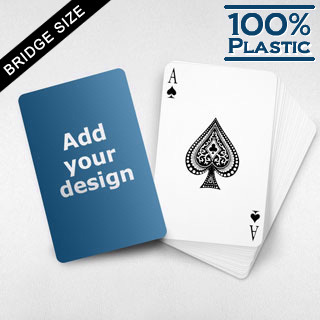 ﻿ Plastic playing cards Produced in Large Quantity. Size matters. Measure 2.25” x 3.5”, the bridge sized card gives the pack a slender and elegant touch. Our custom plastic cards surface complements the sophistication by creating a silky hand feel. Some marketers like to use it as a treat to guests of a product launch ceremony. Others will use it as a bonus to large quantity buyers. Or, you just want to tailor-make a few packs to impress friends and the gals sitting next table.